So many games are about high energy, or frustrating puzzles. They rely on the adrenaline you get from moving fast and hitting hard or being challenged leaving you hooked hoping to overcome challenging puzzles or challenges, Glass Masquerade has gone a different way. 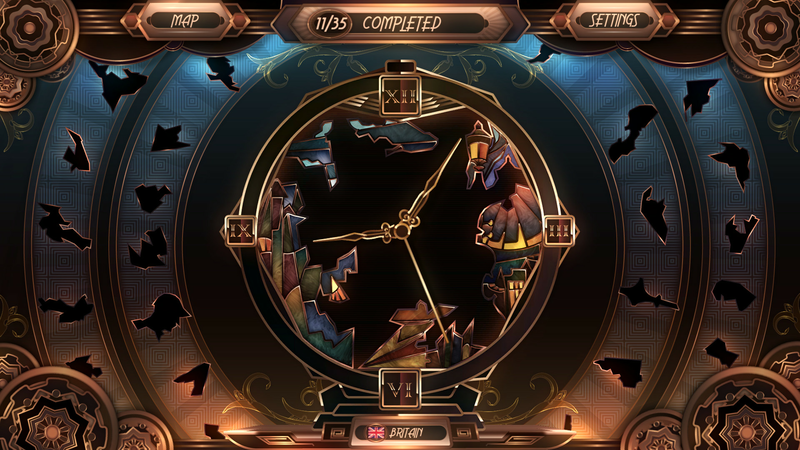 Glass Masquerade is a beautiful little jigsaw puzzle game, that removes the classic board-like feel and has instead gone for a unique stain glass style. Every puzzle looks like it could have come straight out of an old building, both in the shape of each puzzle, and the final image. This unique twist on its own is enough to make Glass Masquerade intriguing, but the pace is what makes it truly special. The game is all about relaxing and enjoying yourself, which is epitomized with the game’s timer. There is a timer for those who do need a little hook to motivate them, but it only shows your time at the end of the game. This means that for someone like me who will look at it and feel like you are failing or doing poorly, it removes that stress, and makes the game a lot more relaxing. Puzzle pieces themselves come in some of the weirdest shapes I have seen in any kind of puzzle game, with curved pieces and all manners of shapes sticking off them. This seems like it would make the game way easier, but holes in your puzzles may be filled by three quirky shapes so it’s not always easy to see without experimentation how a piece will fit in. Puzzle pieces which appear on the outside of the ring are always blacked out so you can only guess based on shape, and until you select them, they appear at different angles, making calculated piece selections infinitely harder. This gives the game a trial and error vibe, which is perfect for the relaxed tone of the experience. The beautifully designed stain glass puzzles themselves are based around the world. So, from one puzzle in Portugal showing elegant ships, to Sherlock Holmes in England, to a hieroglyph inspired representation for Egypt. Unpacking the image when all you know is the country is a fun little experience. There isn’t too much more to say about the game than that. It’s a simple and short game, that doesn’t want to do anything but entertain you in the most relaxing way possible. The piece sizes are a little larger than the spots they fit into which can be a little annoying, but aside form that it’s hard to fault this charming little title. Relaxing music and relaxing gameplay making for a wonderful little experience on the Switch that I appreciated.